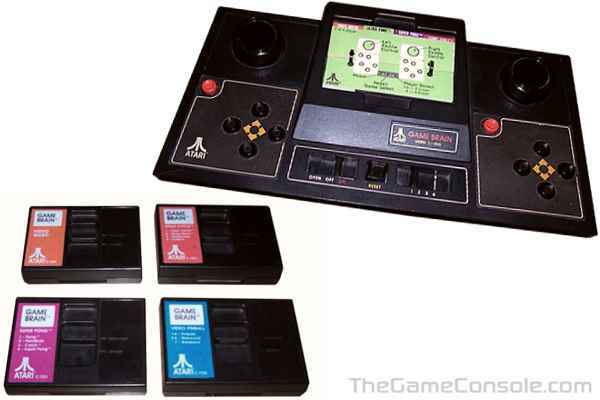 The Atari Game Brain was an unreleased dedicated video game console by Atari. Intended to be released in 1977, it would only have played 10 different games. All of the planned games would have been ports of games from all of Atari's previously released dedicated consoles, such as Pong, Stunt Cycle, & Video Pinball. Its controllers were built onto the system, and included 4 directional buttons, a paddle, and a fire button. Games would be inserted in the top of the system by opening a door, and the door had a small instructions booklet on top of it. The system was never supposed to be a huge seller for Atari. Instead, the system was just their way of clearing out their CPUs from their unsold dedicated consoles. Unfortunately by the time the Game Brain was finished, dedicated consoles were becoming obsolete against consoles with programmable ROMs, such as the already released Fairchild Channel F, the RCA Studio 2, and Atari's own 2600. Noting this, Atari cancelled the Game Brain. Today, only 3 Game Brain consoles are known to exist, as well as 5 prototype cartridges.